شاهقلیان قهفرخی, داود, طحانی, وحید, رحیمی, غلامحسین. (1395). بررسی تجربی و عددی اثر تقویت‌کننده‌های طولی و عرضی بر رفتار خمشی ورق‌های کامپوزیتی مشبک. علوم و فناوری کامپوزیت, 3(4), 333-342. داود شاهقلیان قهفرخی; وحید طحانی; غلامحسین رحیمی. "بررسی تجربی و عددی اثر تقویت‌کننده‌های طولی و عرضی بر رفتار خمشی ورق‌های کامپوزیتی مشبک". علوم و فناوری کامپوزیت, 3, 4, 1395, 333-342. شاهقلیان قهفرخی, داود, طحانی, وحید, رحیمی, غلامحسین. (1395). 'بررسی تجربی و عددی اثر تقویت‌کننده‌های طولی و عرضی بر رفتار خمشی ورق‌های کامپوزیتی مشبک', علوم و فناوری کامپوزیت, 3(4), pp. 333-342. شاهقلیان قهفرخی, داود, طحانی, وحید, رحیمی, غلامحسین. بررسی تجربی و عددی اثر تقویت‌کننده‌های طولی و عرضی بر رفتار خمشی ورق‌های کامپوزیتی مشبک. علوم و فناوری کامپوزیت, 1395; 3(4): 333-342. سازه‌های مشبک به‌علت خواص مکانیکی ایده‌آل، سفتی مخصوص و استحکام بالا؛ یکی از سازه‌های پرکاربرد در صنایع هوایی، موشکی و دریایی می‌باشد. در این تحقیق به بررسی تجربی و عددی اثر تقویت‌کننده‌های طولی و عرضی بر رفتار خمشی ورق‌های کامپوزیتی مشبک پرداخته شده است. برای این منظور چهار نوع ورق مشبک با تقویت‌کننده‌های مثلثی، لوزی، مربعی درشت و ریز در نظر گرفته شد. برای ساخت این ورق‌ها، قالب سیلیکونی طراحی و ساخته شد. سپس از روش لایه‌چینی و لایه‌پیچی دستی برای ساخت ورق‌ها استفاده شد. نمونه‌های ساخته شده تحت آزمایش خمش سه نقطه‌‌ای قرار گرفتند که برای این منظور نیز فیکسچری طراحی و ساخته شد. از حل عددی مسئله و مقایسه با نتایج تجربی مشاهده شد که اختلاف بسیار کمی بین نتایج تجربی و عددی وجود دارد. نتایج نشان می‌دهد که تقویت‌کننده‌های طولی اثر بسیار زیادی بر بار بیشینه مخصوص ورق دارا می‌باشند، به‌طوری‌که با اضافه کردن یک تقویت‌کننده‌ی طولی، استحکام ورق 594% افزایش می‌یابد. این در حالی است که تقویت‌کننده‌های عرضی به‌دلیل افزایش وزن، نه تنها باعث افزایش بار بیشینه مخصوص و سفتی مخصوص نمونه نمی‌شوند بلکه باعث کاهش 14/7% استحکام و 9/26% سفتی مخصوص می‌گردند. اولویت قرار گرفتن تقویت‌کننده‌ها از لحاظ بیشینه استحکام به‌ترتیب نمونه مربعی درشت، مربعی ریز، نمونه مثلثی و نمونه لوزی شکل و از لحاظ حداکثر سفتی مخصوص به‌ترتیب نمونه مربعی درشت، مربعی ریز، نمونه لوزی و نمونه مثلثی شکل می‌باشد. Yang, L. Yan, Y. and Kuang, N., “Experimental And Numerical Investigation Of Aramid Fibre Reinforced Laminates Subjected To Low Velocity Impact “, Polymer Testing, Vol. 32, No. 7, pp. 1163-1173, 2013. Jadhav, P. and Mantena, P. R., “Parametric Optimization Of Grid-Stiffened Composite Panels For Maximizing Their Performance Under Transverse Loading “, Composite structures, Vol. 77, No. 3, pp. 353-363, 2007. Hosomura, T. Kawashima, T. and Mori, D., “New CFRP Structural Elements (For Spacecraft) “, Composite materials: Mechanics, mechanical properties and fabrication, pp. 447-452, 1981. Gibson, R. F. Chen, Y. and Zhao, H., “Improvement Of Vibration Damping Capacity And Fracture Toughness In Composite Laminates By The Use Of Polymeric Interleaves “, Journal of engineering materials and technology, Vol. 123, No. 3, pp. 309-314, 2001. Kidane, S., “Buckling Analysis Of Grid Stiffened Composite Structures,“ Thesis, Faculty of the Louisiana State University and Agricultural and Mechanical College in partial fulfillment of the requirements for the degree of Master of Science in Mechanical Engineering in The Department of Mechanical Engineering By Samuel Kidane B. Sc., Addis Ababa University, 2002. Kidane, S. Li, G. Helms, J. Pang, S. S. and Woldesenbet, E., “Buckling Load Analysis Of Grid Stiffened Composite Cylinders “, Composites Part B: Engineering, Vol. 34, No. 1, pp. 1-9, 2003. Gan, C., “Behavior of grid-stiffened composite structures under transverse loading", PhD Thesis, Wayne State University, USA, 2003. Gan, C. Gibson, R. F. and Newaz, G. M., “Analytical/Experimental Investigation Of Energy Absorption In Grid-Stiffened Composite Structures Under Transverse Loading “, Experimental mechanics, Vol. 44, No. 2, pp. 185-194, 2004. Chen, Y. and Gibson, R. F., “Analytical And Experimental Studies Of Composite Isogrid Structures With Integral Passive Damping “, Mechanics of Advanced Materials and Structures, Vol. 10, No. 2, pp. 127-143, 2003. Maricherla, D., “Advanced Grid Stiffened Composite Structures,“ Thesis, Louisiana State University, 2005. Fan, H. Meng, F. and Yang, W., “Sandwich Panels With Kagome Lattice Cores Reinforced By Carbon Fibers “, Composite Structures, Vol. 81, No. 4, pp. 533-539, 2007. Jadhav, P. Mantena, P. R. and Gibson, R. F., “Energy Absorption And Damage Evaluation Of Grid Stiffened Composite Panels Under Transverse Loading", Composites Part B: Engineering, Vol. 37, No. 2, pp. 191-199, 2006. Li, G. and Cheng, J., “A Generalized Analytical Modeling Of Grid Stiffened Composite Structures “, Journal of Composite Materials, Vol. 41, No. 24, pp. 2939-2969, 2007. Hou, A. and Gramoll, K., “Compressive Strength Of Composite Lattice Structures “, Journal of Reinforced plastics and composites, Vol. 17, No. 5, pp. 462-483, 1998. Zhang, Z. Chen, H. and Ye, L., “A Stiffened Plate Element Model For Advanced Grid Stiffened Composite Plates/Shells “, Journal of composite materials, Vol. 45, No. 2, pp. 187-202, 2011. Zhang, Z. Chen, H. and Ye, L., “Progressive Failure Analysis For Advanced Grid Stiffened Composite Plates/Shells “, Composite Structures, Vol. 86, No. 1, pp. 45-54, 2008. Yazdani, M. Rahimi, H. Khatibi, A. A. and Hamzeh, S., “An Experimental Investigation Into The Buckling Of GFRP Stiffened Shells Under Axial Loading “, Scientific Research and Essays, Vol. 4, No. 9, pp. 914-920, 2009. Yazdani, M. Rahimi, G., “The Behavior Of GFRP-Stiffened And-Unstiffened Shells Under Cyclic Axial Loading And Unloading “, Journal of Reinforced Plastics and Composites, Vol. 30, No. 5, pp. 440-445, 2011. Hemmatnezhad, M. Rahimi, G. and Ansari, R., “On The Free Vibrations Of Grid-Stiffened Composite Cylindrical Shells “, Acta Mechanica, Vol. 225, No. 2, pp. 609-623, 2014. Hemmatnezhad, M. Rahimi, G. Tajik, M. and Pellicano, F “Experimental, Numerical And Analytical Investigation Of Free Vibrational Behavior Of GFRP-Stiffened Composite Cylindrical Shells “, Composite Structures, Vol. 120, pp. 509-518, 2015. Yazdani, M. and Rahimi, G., “The Effects Of Helical Ribs’ Number And Grid Types On The Buckling Of Thin-Walled GFRP-Stiffened Shells Under Axial Loading “, Journal of Reinforced Plastics and Composites, 2010. Rahimi, G. Zandi, M. and Rasouli, S., “Analysis Of The Effect Of Stiffener Profile On Buckling Strength In Composite Isogrid Stiffened Shell Under Axial Loading “, Aerospace science and technology, Vol. 24, No. 1, pp. 198-203, 2013. Khosravi, H. and Eslami Farsani, R., “An Experimental Investigation Into The Effect Of Surface-Modified Silica Nanoparticles On The Mechanical Behavior Of E-Glass/Epoxy Grid Composite Panels Under Transverse Loading “, In Persian, Journal of Science and Technology of Composites, Vol. 3, No. 1, pp. 11-20, 2016. 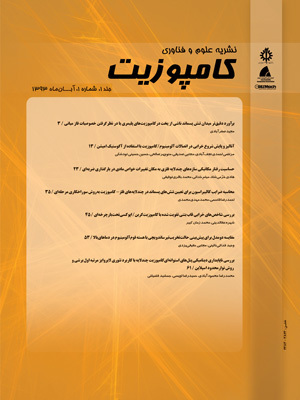 Tehrani Dehkordi, M., “Numerical Modeling Of Bending Behavior Of Intra-Ply Hybrid Composites Using Finite Element Method “, In Persian, Journal of Science and Technology of Composites, Vol. 2, No. 4, pp. 59-66, 2016. Higgins, P. J. Wegner, P. Viisoreanu, A. and Sanford, G., “Design And Testing Of The Minotaur Advanced Grid-Stiffened Fairing “, Composite Structures, Vol. 66, No. 1, pp. 339-349, 2004. Hedayatian, M. Liaghat, G. H. Rahimi, G. H. and Pol, M. H., “Numerical And Experimental Analyses Projectile Penetration In Grid Cylindrical Composite Structures Under High Velocity Impact “, Modares Mechanical Engineering, Vol. 14, No. 9, pp. 17-26, 201. Hashin, Z., “Failure Criteria For Unidirectional Fiber Composites “, Journal of applied mechanics, Vol. 47, No. 2, pp. 329-334, 1980.